It’s been exactly one week since my husband and I had to make a decision that was equal parts obvious and heartbreaking—that of accelerating the process of our cherished Duke’s passing. While I’ve felt zero remorse about our choice, I’ve certainly had my share of moments since then ranging from somber to blubbering. Fewer as the week wore on, but still. But still. 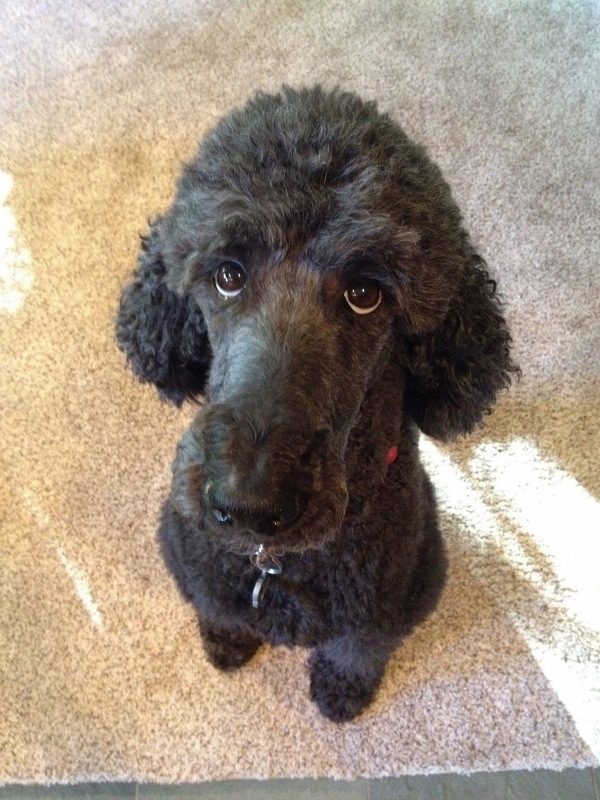 During a lively phone conversation with my father-in-law this morning, our poodle’s passing came up and once again I found myself wiping away tears I thought I'd exhausted. All week I’d been trying to think of some way to commemorate Duke within the home because, let’s face it, it’d be kind of creepy to continue maintaining the makeshift shrine I erected on a table in the foyer. I mean, at a certain point a girl’s got to tuck away her dead dog’s ID tag and quit lighting candles for him, right? But I had no idea how, what. Until I emerged from my workout in the outdoor pool at the gym this afternoon and sat poolside checking email on my phone. There, in my Facebook “other” in-box, was a message from a friend of a friend, someone I’d never heard of or met, a complete stranger. I noticed immediately that her message contained one of my favorite photos of Duke, which I assumed she had downloaded from my Facebook status or the most recent story on my blog. But then I realized it wasn’t my photo at all, but rather a beautiful charcoal portrait, a replica of my photo of Duke, in which she’d managed to capture the soulful imploring eyes of my big furry son perfectly. And the tears came again. This time, however, they weren’t for the loss of Duke, but rather the kindness of the artist, this woman I’ve never met, who had not only been moved to draw my beloved Duke Buddy but also offered to send me the portrait. No cost. No strings attached. Just one of those rare and wonderful connections made for no other purpose than that of expressing one’s humanity. I'm all weepy reading this. What a lovely thing Eileen has done, and what a beautiful portrait of Duke. Love to you, Lauren. Loving your pictures and the simple and beautiful way you have put your story across - you're an inspiration and I am following your journey - awesome work!